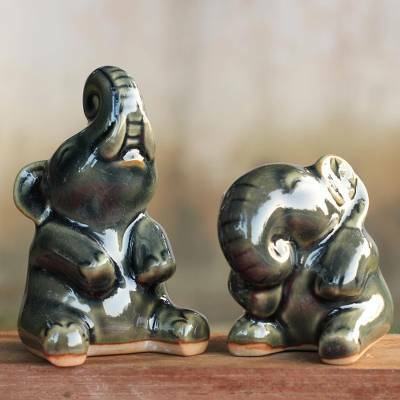 Handcrafted Dark Green Celadon Ceramic Elephants (Pair), "Happy Dark Green Elephants"
Duangkamol conveys the universal emotions expressed by Thai elephants. Working in green and indigo celadon ceramic, she creates an enchanting pair of statuettes. The lovely blue pachyderms are wonderfully detailed, seeming to share in belly-shaking laughter. You can find celadon ceramic statuettes 'Happy Dark Green Elephants' (pair) by Duangkamol in sculpture categories such as Animal Themed Sculpture, Celadon Sculpture and Ceramic Sculpture. Enjoy exploring these sections for other Novica treasures.